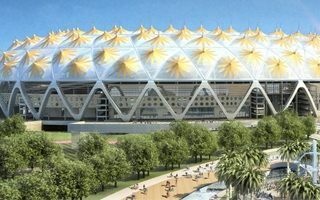 The Federal Sports Commission of Ethiopia has revealed it will accept tenders next month for the delayed Olympic-sized 60,000-seat national stadium in Addis Ababa dubbed Adey Abeba. “The process is open to both local and foreign contractors and should take no more than a month to complete,” Nasir Legesse, director of the Information and Communication Directorate, at the sports authority told Zawya Projects in an exclusive. He added that the largest stadium in Ethiopia, which will be built over 67,000 square meters at an estimated cost of $100 million (2,033 billion birr), is financed by the Ethiopian Government and will take an estimated two years to complete. Interestingly, the stadium will be built along a new design, commissioned in 2014 despite already having a concept ready since 2012. There was no official explanation as to why the Federal Sports Commission decided to scrap the original scheme. Previous joint-bid design winners, German firm Laboratory for Visionary Architecture (LAVA) and local firm JDAW Consulting Architects and Engineers were ousted from the project; JDAW has filed a lawsuit before Ethiopian courts seeking to have an injunction against the sports commission.